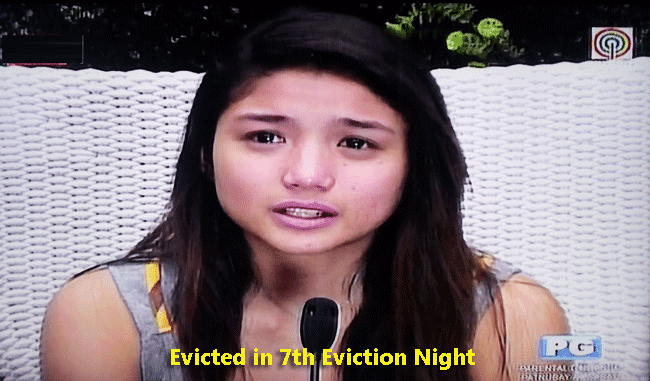 PBB housemate Kim Nichole Baranda Evicted out in PBB ALL IN Edition 7th Eviction Night June 29, 2014. Kim Nichole Baranda is the fifth housemate and the daughter of TV host and celebrity, Phoemela Baranda. Dubbed "Sweet Revelation ng Makati,” Nichole would like to unveil a lot of her and reveal all the secrets about her personality. Nichole is 15 years old and she is one of the housemates who were revealed at “Buzz ng Bayan” on Sunday afternoon. The 7th eviction night has on Saturday, wherein the names of the two housemates who were safe were announced. Joshua and Loisa got the highest votes that made them stay inside the house. The 2nd part of the eviction night was on Sunday wherein there were three housemates left for the eviction namely Nichole, Fifth and Daniel. Before the eviction proper, the housemates were emotional as they gathered to the pool area to talk, bond and sing “Pinoy Ako” while Maris was doing the accompaniment. While singing and holding hands, Fifth could not control his emotions anymore that made him cry along with other housemates. He expressed his desire to stay inside the house because he will surely miss them all. Big Brother then called inside the confession room his twin Fourth to talk about the situation of his brother and he turned emotional putting himself on his shoes. Fourth said that he felt like he was also nominated because he felt his brother’s agony. Going back to the eviction proper, Host Toni Gonzaga talked to the housemates and asked their feelings and thoughts on the upcoming result of eviction knowing the fact that one of them will make his or her exit from the house. The three housemates who were nominated were holding hands and they were expecting for the worst as Nichole quoted. Then the moment of truth came. Host Toni Gonzaga first announced who among them is safe and he was Daniel. Daniel then can breathe well because he was safe. On the other hand, the two remaining housemates who were in danger of eviction kept their fingers crossed though expecting for the worst. In the end, it was Nichole who was evicted. Tears flew like a river inside the PBB House.